A fixed 4% Puerto Rican income tax rate in the net income, increased up 10% at renewal. Full property and municipal license tax exemptions. 6% income tax rate on distributions to Puerto Rican resident shareholders. 0% tax rate on distributions to non-Puerto Rican resident shareholders. Submit articles of Incorporation and bylaws. Hire at least 4 employees. Have an authorized capital of $5,000,000 and at least $1,500,000 paid capital to start. Have $300,000 financial guarantees acceptable to OCFI. Provide personal statements for 10% or more shareholders. Submit an application to the OCFI for a permit to organize an IFE. Pay a $5,000 nonrefundable fee and same annual fee if approved. If you are successful in your application, the Tax Grant will be authorized for 3 consecutive periods of 15-years, making it 45 years in total. The extensions are requested from 6 to 24 months before the end of applicable 15-year term. This type of banking license will give, after a separate process of application, scrutiny and due diligence, access to the US federal banking system. But for this, the board of directors and officers should be quialified US bankers with a long proved history in the US banking industry. Accept deposits and borrow money from non-residents of Puerto Rico and certain government institutions. Place deposits in any Puerto Rican bank and foreign banks organized in Puerto Rico. Make loans and issue letters of credit to non-residents of Puerto Rico. Discount money orders and bills of exchange to non-Puerto Rican residents. Invest in securities and stocks, as well as Puerto Rican government bonds exempt from tax. Carry transactions in any currency and gold or silver and foreign currency trade. Underwrite and trade notes and debt instruments issued by non-Puerto Rican residents. Engage in trade financing of import and export of raw materials and finished goods. Acquire and lease personal property on behalf of non-Puerto Rican residents. Establish branches outside Puerto Rico in the continental USA or in other foreign country. 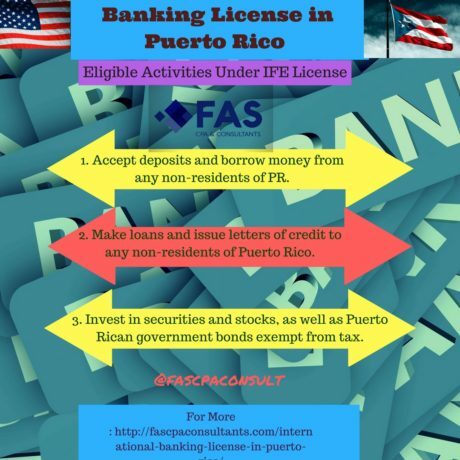 Act as a fiduciary, executor, administrator, registrar of stocks and bonds, custodian, trustee, agent and any other fiduciary capacity with non-residents of Puerto Rico after obtaining a special permit from the government. If this is not compelling enough, we are glad to inform you that there are additional benefits to opting for Puerto Rican residency for individual investors. If you want to hear more about it and make sure your application will be successful, give us a call and one of our experts will be happy to take your case and see it through, resulting in opening new horizons for your organization and assets.